Blue eyes are a gorgeous natural feature, but there is a chance that your beautiful blue eyes go totally unnoticed if you are not using the correct makeup shades. We visited Samantha Chapman, makeup artist at Pixiwoo and we asked her for advice on which color is the best for women who have blue eyes. Her advice was – never use blue shades. She explained that you should use the opposite color on the color wheel and the opposite of blue is orange, so you should use any colors which contain a lot of orange in them. She recommended a brown with an orange undertone, such as MAC’s Eye Shadow in Coppering or Red Brick. She explained that many women think that they should use blue eye shadow if they have got blue eyes, but this is not true. 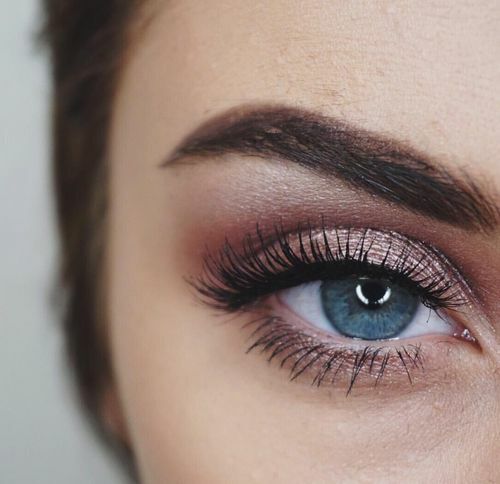 The blue eye shadow you apply will be a more blue than the blue color of your eyes so it will make your eyes appear less blue and not more blue. When it comes to your lips, she recommends using an orange or red lipstick. Her favourite lipsticks for blue eyes are Illamasqua’s Lipstick in Box and MAC’s Russian Red or MAC’s Ruby Woo.